Edit to add. Joanna is good too. Put her in op defense and training Jeff for sure. Nice luck @Techfall! 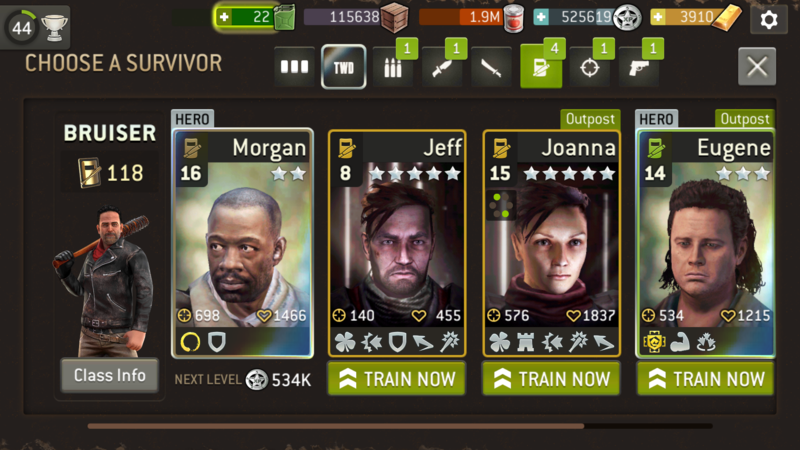 I'd pick Jeff, load him up with +health and damage reduction badges, and toss him into a pit of +5rsl walkers with Sasha or Morgan as leader and watch him go. I'll go with iron skin over defensive stance, since DS only works in overwatch and the beauty of retaliate and punish is to get 3 attacks per turn (normal attack, retaliate attack, punish). My bruiser is basically at the 80% damage reduction cap, so the extra percentage from DS would be lost anyways. Thanks all, do you find yourself using bruiser at max? Are they helpful in distance? If you mean fully upgraded and equipped then yes. And yes they are great for the distance once charged up. Handy for high lvl armored walkers. Jeff is perfect! Exact survivor I'm currently looking for.